Now in its 7th year, the Clare Island Adventure Race 2019 is set to take place on Saturday, 27th April – the weekend before the May Bank Holiday. Given the island setting, this is a coastal race featuring varied topography. Combining running, cycling, hill running (for the longer course) and a beach obstacle course, this is a challenging race with a light-hearted spirit. The race starts at Go Explore Hostel & Sailor’s Bar, venue for the after-party and offers single beds in en-suite dorms or rooms of 6 or 8 which can be booked by groups. The bed night rate is €30 per person including a light breakfast. Visit www.goexplorehostel.ie for more info or call 098 26307/087 4108706 to make a reservation. This event will appeal to both experienced and novice adventure racers. There are two options. First for the experienced racer. The full course will be the perfect warm-up race for a busy season ahead. With the climb of Knockmore, this race is no picnic and will present a serious challenge even to seasoned adventurers. For those who might not be back in shape after the winter – or for beginners – the Spirit Race omits the climb of Knockmore, and has a shorter cycle, making it very doable although still reasonably challenging. 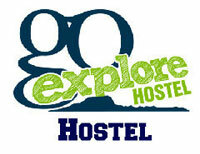 Start at Go Explore Hostel & run along tarmac road with a small piece of green road, wet in areas, and back to hostel. Start at Go Explore Hostel & cycle along tarmac / rough road to the gravel pit situated at the foot of Knockmore. Start at Gravel Pit & run along green road for 1km before beginning the mountain climb from circa 100m to 460m and back down the same way to the Gravel Pit. Start at Gravel Pit & cycle along tarmac roads through the Church Gate and along the westerly side of the island to complete the Clare Island circuit & back to the harbour. Run from the bike drop off at the pier and navigate through the beach activities before the final 200m dash to the hostel and the finish. * This is the mandatory cycling kit and can be left with your bike in the transition. ALL other mandatory kit MUST be carried with you during the race. The run / climb sections of the race bring you through some of the most beautiful countryside in the country with spectacular views spanning the entire Clew Bay area from the Killary Fjord, Mweelrea Mountain, Croagh Patrick, Westport, Mulranny and Achill Island. Any person found littering will be immediately disqualified. Caution: Always obey the rules of the road. Watch the road for markings of areas of special risk (please note that these markings do not identify all areas of risk). Wear suitable shoes for downhill, wet, off road conditions. Competitors must check in with the marshal at each transition point identified on the map. This event will become part of a calendar of race events throughout the year on Clare Island. 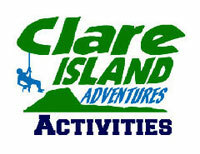 Please remain up to date on upcoming events by liking Clare Island Adventures on Facebook. The After-Party is open to competitors and supporters alike. Hosted by the Sailor’s Bar which is gaining a solid reputation as a rocking venue for live music. 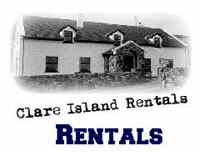 Check www.clareisland.info to stay up to date on acts as they are booked. Registration on the day opens at 11.30am, but pre-registration is advised – save time, stress and ferry fare! Note – Voucher for 2 adults and up to 4 kids and must be used in 2019 season. Family rooms can only be offered from Sunday to Thursday nights.